the high-seas tugs, the true lorries of the high seas. the Société des Oeuvres de Mer (founded by doctor Charcot) and the fishing supply sailing ships. Apart from islands, some obstacles may be indicated where it is impossible to build a light, for stable terrain, for instance the sand banks. A lightship is mooring there : it is a very loud ship, often red painted, her name written on the hull in large white letters. The lights on her mast are visible at more than eight nautical miles. On bad weather, one can hear her foghorn or a steam whistle triggered by a wood burning boiler, or a bell. Their function exceed signalisation: they may be used also to transmit some weather measures, waves highness and the speed of streams and now to study sea waters pollution or to make some plots on migratories. Several lightships were mooring on some few deep funds, particularly in the Channel and in the North Sea but also off Canada, to mark some dangerous passages. They are today replaced by automatic buoys. Sandettié is the last French lightship to have been in service. The BF6 « Sandettié » launched in 1948 is first appointed on "Dyck" bank in 1949. In 1978, this bank is no more marked out, and BF6 is appointed on "Sandettié" bank until 1989, when she was definitively retired. She is today in the commercial dock in front of port Museum at Dunkerque. Sandettié length is 47.5 m and her beam 7.65 m, her propulsion was provided by a 120 hp electric engine. .
On 11 March 1899 occurs the first radio use to save a distressed ship: the lightship EAST GOODWIN, in the Channel, cables to the South Foreland light, close to Douvres.. BÜRGERMEISTER O'SWALD I on station at Elbe 1 point suffers a violent storm on 27 October 1936, sinks and the 25 crew disappear. On 7 February 1936, the Daunt Rock lightship at Cork harbour way out, COMET, breaks her mooring: the crew is saved by the lifeboat Mary Stanford. The ship will be later recovered and will serve until 1965. Two weather-ships used to take in turn in North Atlantic, every 24 days, from 1959 to 1985, staying in a 10 miles side square, centred on a fixed point. FRANCE 1 was in station at geostationnary point R (or Roméo, 47°N-17°O), located at 600 milles westbound La Rochelle and reached in two days and a half in good conditions. The relief, done between twenty-four and twenty-six daysby her sistership France II, was a long-awaited moment for the crew, as much the new ship carried mail and fresh food supplies..
Amongst the ship missions, her weather observations represent a great part of work. Yet, other services were provided if possible as hydrologic drilling, some ornithological observations to follow birds migrations, some observations of sea mammals permitting to determine their distribution and their displacements ... without missing assistance to ships and people in peril, and help to aerial navigation. MALABAR launched on 16 April 1975, entered in service on 3 February 1976. Powerfull tug of French Navy, MALABAR has for namer town Saint-Pierre et Miquelon from the 22 November 1982. Two 4600 hp Diesel allow her to reach 14 knots. High seas tugs of Malabar type are considered as 2nd class ice-breakers. Since its foundation in 1864 at Le Havre, the Company Les Abeilles has been established in twenty harbours from France, Africa and Oceania. She owns now a fleat of hundred tugs, 7 of them being in Dunkirk, and employes more 1200 people, 80 % of them being sailing staff. The harbour towing provides fluidity, quickness and safety of manoeuvres to the marchand ships going in or out, or inside the docks. One of its most powerfull tugs, Abeille Flandre, is in charge of safety in the "Ouessant rail". The 'FLYING CHRISTINE III' built by Seaward Marine for the St John Ambulance and Rescue Service of Guernsey is based on a Nelson 45 hull, with a one-off superstructure specially designed for the purpose. With the inflatable dinghy, she provides medical aid to people living in the islands and to visiting ships. Hospital ships used to visit the fishermen on the Banks: in 1898, 282 ships were helped, 57 sicks hospitalized and 14 shipwrecks victims saved. 4 342 letters were delivered to 118 ships and 1587 reveived to be send to France. 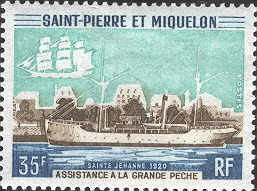 From 1898, the Société des Oeuvres de Mer arms Saint-Pierre and Saint-Paul to assist the fleet of cob fishing off St Pierre-et-Miquelon. Saint-Pierre was built at Buron yards in St Malo and launched on 18 March 1897 to replacer the first of the same name, sunk on 30 May 1896. In 1900, SAINT FRANCOIS D'ASSISE, an iron steam and sail vessel with a 300 hp engine is launched at Nantes. In 1914, SaintE JeHanne is launched at Nantes for the Société des Oeuvres de Mer : 841 tons, 52.8 m length, a triple expansion steam engine of 65 hp, a speed of 11 knots, a crew of 27-29 men..
On 17 March 1920, she is renamed Ste Jeanne d'Arc She is sold on 29 octobre 1935 to be scrapped by a british yard.